Is it me or are rainy days dreary and miserable? Not to be too much of a Debbie Downer, but it’s annoying when you’re out here trying to live your best life and mother nature intends for you to be wet, dripping, and downright uncomfortable. It’s time to turn that frown upside down! I’m here to take the misery out of those soggy days with some fun gear that makes stomping through puddles a bit more tolerable. NOTE: I work with a few affiliate advertising companies, which means that if you click on or purchase a product through a link, I may earn a commission. All opinions on the site are mine and I don’t promote anything I don’t already own or wouldn’t use/buy myself. If you have any questions, feel free to email me using the contact form. 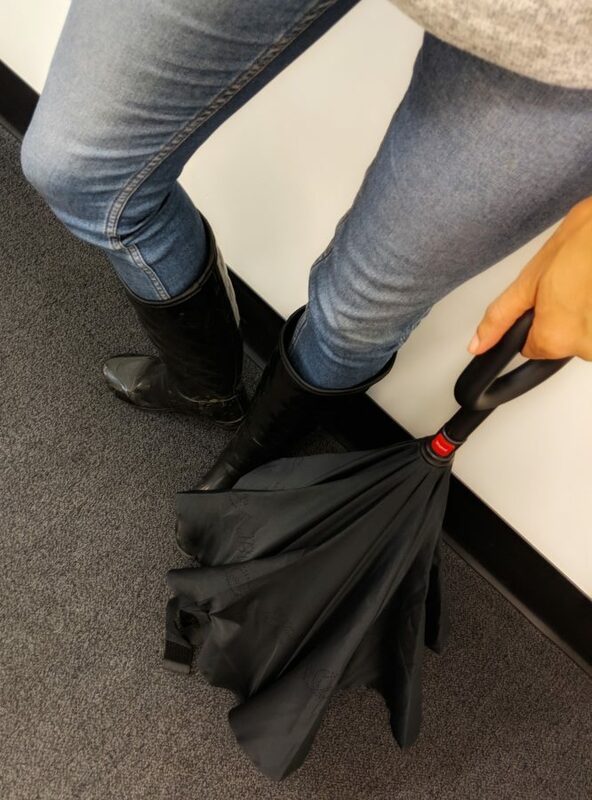 This umbrella on Amazon was recommended by a colleague. I had never seen anything like it before. It’s inverted which means that the rain gets trapped inside the umbrella and doesn’t leak or trip when it’s closed. It also allows the umbrella to stand up on its own. No more awkwardly leaning it up against a wall only to slide down or hanging it on a door. Also, the umbrella has a curved handle so you can hold it hands-free while you’re standing still. I only wear my waterproof boots in the rain. I’ve worn the same Hunter boots for the past 5 years and highly recommend them. They dry fast and the soles have good grip to prevent slipping and sliding around on slick surfaces. Also, because they’re tall, they catch rain splatter. Grab insoles for extra padding. I put these in all my shoes! This is the exact insole recommended by my chiropractor. There’s only one coat I’ve worn in the winter for 3 years running. I have gotten my money’s worth several times over. It’s not only extremely warm, but it is also wind- and water-proof. It’s by Canadian brand, Mackage, and it is phenomenal. Here are other coats from Mackage (sans fur) that I like. Stay tuned, I may do a review of my coat. When it’s raining, I prefer wearing a backpack because it completely frees my hands to carry the umbrella. Carrying a handbag or balancing a shoulder tote is too much to manage in addition to an umbrella. Also, the backpack fits snuggly on my body, underneath the umbrella which prevents it from getting wet. Longchamp is one of my go-to brands because they’re made well and they’re water-resistant. Sabrina Smith is a participant in the Amazon Services LLC Associates Program, an affiliate advertising program designed to provide a means for sites to earn advertising fees by advertising and linking to Amazon.com. Next reading My Outfit from New York Fashion Week | Shop the Look!